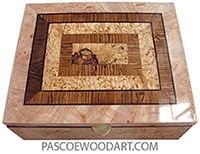 This box is made of solid European alder, a wood very similar to North American cherry with the main differene that alder does not significantly darken with age as does cherry. 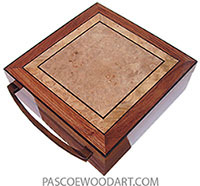 The top design is my unique bevel top design created to frame any one of many possible inlay patterns because the top is basically framed picture. 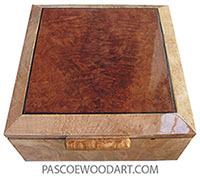 There is an actual frame that holds the top centerpiece which, in this case, consists of Ceylon satinwood and the very rare snakewood with trim of ebony and blood wood. Last updated June 23, 2013. Posted March 15, 2013.